Postphenomenology and Media: Essays on Human–Media–World Relations. Edited by Yoni Van Den Eede; Stacey O’Neal Irwin and Galit Wellner. Foreward by Don Ihde. Contributions by Lars Botin, Pieter Lemmens; Nicola Liberati, Shoji Nagataki, Robert Rosenberger, Fernando Secomandi, Robert N. Spicer, Daniel Susser, Heather Wiltse, Stacey O’Neal Irwin, Galit Wellner and Yoni Van Den Eede. We live in a “mediatized” world where media and technology are changing what it means to be human and how we refer to our environment. “Media” used to be relatively well-defined: books, newspapers, radio, television, … Now they aren’t anymore: they have become increasingly complex, diverse, ubiquitous, enmeshed with our daily lives, invisible, transparent, “seamless” and interactive—all with the shift from analog to digital. Where are media? Everywhere. What are media? We’re not quite sure. Postphenomenology and Media: Essays on Human–Media–World Relations wants to shed light on this situation, on how new, digital media are affecting and shaping humans and their world. It does so by offering for the first time the postphenomenological framework for a dedicated, comprehensive study of “human-media relations.” The postphenomenological toolbox holds many conceptual instruments that can be used to analyze these relations in a fresh, innovative way, such as the transparency vs. opacity distinction, embodiment, multistability, variational analysis, cultural hermeneutics and more, to contribute to new understandings of contemporary media and their evolution. After a preface by postphenomenology founder Don Ihde, the book moves into an introductory chapter by the volume’s editors Yoni Van Den Eede, Stacey O. Irwin, and Galit Wellner, which outlines central issues of media and mediation theory that can be explored postphenomenologically. Next, the collection showcases research at the cutting edge of philosophy of media and technology over the course of twelve chapters in three distinct sections: Exploring Media Environments with Postphenomenology, Postphenomenologically Investigating Media Cases and Shaping Postphenomenological Media Theory. Each section’s contribution enlarges the range of thinking about human-media-world relations in contemporary society, reflecting the interdisciplinary range of this school of thought, and the chapters explore, sometimes self-reflexively and sometimes critically, the provocative landscape of postphenomenology and media. Aided by upbeat examples such as Augmented Reality, GoPro cameras and Artificial Intelligence, authors examine and expand both the postphenomenological framework and the understanding of media, supplementing it with new approaches or perspectives, as ignited by thinking on media. Digital Media: Human-Technology Connection examines what it is like to be alive in today’s technologically textured world and showcases specific digital media technologies that makes this kind of world possible. So much of human experience occurs through digital media that it is time to pause and consider the process and proliferation of digital consumption and humanity’s role in it through an interdisciplinary array of sources from philosophy, media studies, film studies, media ecology and philosophy of technology. When placed in the interpretive lens of artifact, instrument, and tool, digital media can be studied in a uniquely different way, as a kind of technology that pushes the boundaries on production, distribution and communication and alters the way humans and technology connect with each other and the world. The book is divided into two sections to provide overarching definitions and case study specifics. Section one, Raw Materials, examines pertinent concepts like digital media, philosophy of technology, phenomenology and postphenomenology by author Stacey O Irwin. In Section Two, Feeling the Weave, Irwin uses conversations with digital media users and other written materials along with the postphenomenological framework to explore nine empirical cases that focus on deep analysis of screens, sound, photo manipulation, data-mining, aggregate news and self-tracking. Postphenomenological concepts like multistability, variational theory, microperception, macroperception, embodiment, technological mediation, and culture figure prominently in the investigation. The aim of the book is to recognize that digital media technologies and the content it creates and proliferates are not neutral. They texture the world in multiple and varied ways that transform human abilities, augment experience and pattern the world in significant and comprehensive ways. Acoustic Technics opens with the 19th century discovery of radiation which exceeds our human bodily perceptual experience, light beyond light, sound beyond sound and on into what today we call the electromagnetic spectrum. Claiming a second scientific revolution through imaging technologies and drawing from both instrumental sensory mediation and animal studies, Acoustic Technics follows listening in its new forms into music, echo-location, infra and ultra-sounds, medical diagnosis, surveillance, and subsurface and interplanetary domains. Synthesized sounds, sonification, in both esoteric and popular technologies such as earbuds, cellphones, television are analyzed from a postphenomenological perspective. Why does the announcement of a new cellphone model ignite excitement and passion? Why do most people return home when they forget their cellphones, while only few would return for their wallets? How did the cellphone technology become so dominant for many of us? This book offers an analysis of the historical evolution and of the meanings of this technology in the lives of billions of people. The book offers a unique point of view on the cellphone that merges genealogical analysis of its development since the 1990s and philosophical insights into a coherent analytical framework. With new concepts like “histories of the future” and “memory prosthesis,” the book aims to explain the excitement arising from new model announcements and the ever-growing dependency on the cellphone through the framing of these experiences in wide philosophical contexts. It is the first philosophical analysis of the important roles the cellphone plays in contemporary everydayness. Friis and Crease capture Postphenomenology, a new field that has attracted attention among scholars engaged in technology studies. Contributors to this edited collection seek to analyze, clarify, and develop postphenomenological language and concepts, expand the work of Don Ihde, the field’s founder, and scout into fields that Ihde never tackled. 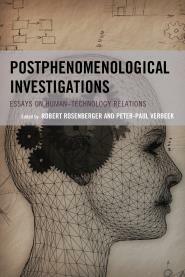 Postphenomenological Investigations: Essays on Human–Technology Relations, edited by Robert Rosenberger and Peter-Paul Verbeek. This text provides an introduction to the school of thought called postphenomenology and showcases projects at the cutting edge of this perspective. Postphenomenology presents a unique blend of insights from the philosophical traditions of phenomenology and American pragmatism, and applies them to studies of user relations to technologies. These studies provide deep descriptions of the ways technologies transform our abilities, augment our experience, and shape the world around us. If you are interested in submitting a proposal, please contact Robert Rosenberger (robert.rosenberger@pubpolicy.gatech.edu), Don Ihde (don.ihde@stonybrook.edu), or Peter-Paul Verbeek (p.p.c.c.verbeek@utwente.nl).